Let the Carnival Pride guide you through the most beautiful stretches of the Caribbean in the comfort of her stylish cabins. 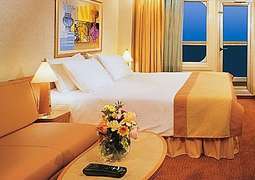 Categories include inner, outer and balcony cabins, as well as luxurious suites. 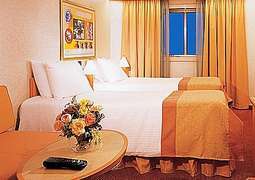 Each cabin is guaranteed a complementary 24-hour room service to attend to your every need. The Steak House, Normandie Restaurant, Bistro with ocean view, a sushi bar and healthy Spa Carnival Menus—this wide variety of culinary offerings provides something delicious for every palate. Countless bars, clubs and lounges offer guests a fantastic drinks menu. The Carnival Pride prides itself in its excellent entertainment programmes for all ages. The Twister waterslide—spanning three decks— is particularly impressive. Other fun activities include a mini-golf course, basketball and volleyball courts, table tennis, an outdoor athletic track and multiple pools, including one especially for kids. While the adults relax in the sun in the exclusive, kid-free Serenity area, the smaller sailors on board can have fun with fantastic children’s entertainment programming. Teens are invited to meet up in the Club 02 for parties, video games, and much more. The Carnival Pride Taj Mahal Show Lounge is the place to be for dazzling shows, live bands, international artists and comedians, or you could take the stage yourself with karaoke in the Butterflies Lounge. 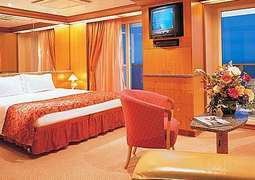 Particularly special evening events include the Captain’s Dinner, Gala Dinner and the Farewell Party. 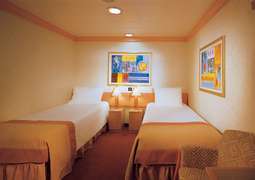 Let yourself be pampered in the wellness area of the Carnival Pride. The excellent wellness programme promises massage treatments, a sauna, steam bath, jacuzzi and a manicure and hair studio. Those looking to stay active on board can do so with the steppers, treadmills, bicycles and various exercise classes offered in the fitness centre.